So the countdown to the Cornfather’s departure continues with just a few strips left! I think any more than that and jefbot’s pestering will make the Cornfather positively homicidal. ha! i think if you ask real nicely, BOThostess Pixie will give you some cookies and cocoa, fig! Hiya Fig! Are you a NewBOT? If you are please accept this Welcome Aboard packet complete with hot cocoa and cookies of DOOM. Mmmmmm Cookies of DOOM! I’ll be your tour guide to the fabulous BOTiverse. Should you have any questions, please feel free to ask. Welcome and the hazing only hurts for like a month or two I promise. If you aren’t a NewBOT, Cocoa and Cookies are on the refreshment table! Help yourself. thanks, as always, for extending the red carpet (and cocoa and cookies), Pixie! trust me, they were awesome cookies, Dengro! yikes! those are some sharp daggers there, G-Man0091! so close this time, EC! keep trying! I LOVED the Last Airbender! I caught it on reruns on TV and couldn’t get enough of it. I mean I watched all the episodes at LEAST 5 times. It was cut too short but I hope the new one is just as good. glad to hear from a fellow Airbender fan, JP! and my fingers are crossed that Korra lives up to its predecessor’s quality! Try fried chicken on demand (that “have I eaten?” strip is still one of my top five) and first shot at the remote. I feel like many a duo or group of friends has watched Avatar: The Last Airbender together. I did it with my roommate and we are thinking about doing it again with his girlfriend. You are going to love the final episode. This reminds me of when my brother moved out, good try Bot. My last ditch effort were brownies. so i take it brownies didn’t work any better than Airbender, Burnout and cookies, Anime fan. nice try, though! mMmmMM… brownies. Man, nothing can convince the Cornfather. I don’t know how he resisted all of those things. More resistance than I have. Anyway, The Last Airbender’s final episode is so amazing, that it remains my favorite final episode of any show to this day. I absolutely loved it. Can’t wait for Legend of Korra! Big fan of the toon. Was pissed off when my channel stopped running it after 2nd season. hey, Jf300! was wondering where you’ve been; glad to have you back! so did you ever end up catching the 2nd or 3rd seasons? if not, you must track them down. sooooOOo good! yeah, best to leave the movie unseen, artisan54. it’s sad, too, cuz had the movie been good, we could’ve seen the 2nd and 3rd seasons adapted for the live action big screen! *gasp* are those cookies of DOOM i see?! *is proud* Great art work on those BTW. We, we magnificent BOTS, now is the moving of our discontent, made by the mom from Philly. anyway, Pixie, maybe we should decide on a universal term for the… BOTskeeters. hmmm… “BOTiN8ors” is pretty good, G-Man0091! like you said: keep ’em coming! Ooh! I’d play that game, personally; I have BOTtons on my laptop backpack, and get compliments on them all the time. g’morning! and: ha! yes, i guess they could be the “cookies of DOOM,” Pixie! I would probably never have seen the Airbender series if I didn’t have teenaged boys. As it was, I only watched it when they did, but thoroughly enjoyed it every time I did. The ending was excellently done and the whole show was very well written and drawn. I hadn’t heard about the spinoff series, tho, will have to look for it. If anyone ever says, “Hey, lets take a really excellent animated series and turn it into a live action version of “The 1970’s series Kung Fu meets Dances With the Stars,” again, shoot me before I buy a ticket. i was pleasantly surprised at how well the series was done, andy! let’s just hope the spinoff is even remotely as good. i might have to make a comment thread for it in the blog, just so we can all sound off about it when Korra debuts! and, yes: let the powers-that-be never let M. Night do an adaptation of a beloved animated property ever again. SHUT UP, CORNFATHER! Just…look at that smug expression in that third panel! It’s like he ENJOYS the anguish our Bot’s going through! I’ll take some cookie, that would be more than enough incentive for me to stay. Heck, it’s one of the reasons I married my wife, she’s made some good cookies! Bots salesman grin in first two panels is awesome! Thats how you go around persuading people… and it usually doesnt work. And… Cookies? Now, THATs desperation. glad you noticed bot’s grin in the first couple panels, then his desperation in the last one, Maryz! and you’re right: sadly, those tactics rarely ever work. Poor ‘bot. Breaking up is hard to do. so true, Stan. so true. Our whole family loves Avatar. In fact, my daughter has been re-watching them lately. She is on the Fire season right now too. They are AWESOME! Sokka and Toph are simply hysterical. I love all the Sokka-isms. Sparky Sparky Boom Man is one of my favorites that I got to see again recently with my daughter. And the whole episode where Aang first manages to earth bend and frees Sokka from being trapped with the baby sabertoothed moose-lion. “Aang, this is Foofoocuddlypoops. Foofoocuddlypoops, this is Aang.” That one cracks me up. Actually, there are many that crack me up. yep! will definitely be at the Phoenix con again this year, hopefully with Mombot & Popbot, too. hope to see you (and the broodlings) there! I loved the few episodes I’ve seen of The Last Airbender, but I didn’t have cable so I couldn’t watch it. I never thought of netflix… I’ll have to cancel plans for the next few days! ha! who knew cookies had such power, FunnyShaffer? I love the sly “come hither” look on bot’s face in panel 2, contrasted with “the mitts are off” (pun intended) in panel 3… and those mitts are yellow! So does this mean the Cornfather will truly be departing the strip as a regular? If you’re not hanging out with Michael that much anymore, I hope you didn’t run out of material. You know I was just joking about a replacement last time. well, the Cornfather has been more of a supporting player rather than a regular for the past couple of years, KIM, so expect more of that. no doubt he’ll show up every now and then, but he’s definitely moving out of the apartment. I was on here, earlier, commenting the hell out of the previous strip. I come back a few hours later, and this was posted while I was at supper, meaning I miss out on the shades. What a twisted sense of humor the universe has. what kind of a sick person turns down cookies! I gotta save I love the avatar series too. I caught it right in the middle of a marathon, but managed to download (poor) copies of each episode. Thinking about redownloading them… they’re really awful copies… they render at about 5×10…. I’m assuming you’ve seen the movie? I didn’t exactly care for it… Seemed too rushed if you’ve watched the series. yes, the Cornfather’s moral character must be questioned when he turns down cookies, steve! and sorry to hear about the bad-quality Airbender downloads. you might just wait until Nickelodeon does another marathon since i’m sure that’ll be happening with Korra coming out soon. and, yes: saw the movie and agree that it’s bad. i’d rather watch your 5×10 copies of the original animated version than watch it again! Our totBOT took over our netflix account almost right after we set it up. She even has a Roku in her room. (Btw, she’s 3.5yrs.) She discovered Avatar: The Last Airbender a few months ago… She’s watched the entire series. Thrice. I think she’s on round four–except she is distracted by Dragon Hunters (again). LOVE the strip. I do look forward to however it turns out after Cornfather finally moves out. I think Bot might be lonely at first, but he’ll find a distraction? glad she’s already learned to appreciate good stuff even at that age, Ky! I loved The Last Airbender series. The live action movie was crap mostly, in my opinion, because it tried to fit the entire first season into a roughly hour and a half long movie and failed. I wasn’t aware of the spinoff so you’ll have to tell me when that starts showing. 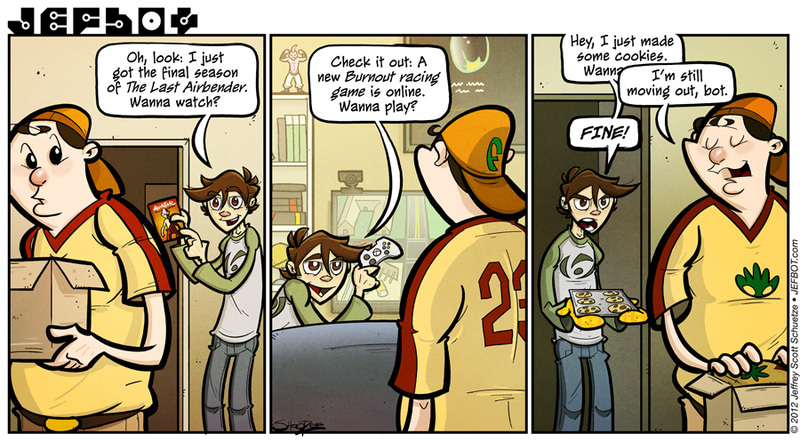 And because of the second panel, do you even look at your 360 anymore? PS: Sorry for being so quiet lately. I’ve been distracted by video games a lot lately. agreed, Fijiman: they tried to force all of the first season into a 90 minute movie, and it proved impossible. it would work better as a miniseries, but since we already have the animated series, it’s kinda like, what’s the point? they should’ve just taken the “spirit” of the animated version and made a live-action movie along those lines. or just not made a live-action version, period. i haven’t had much time to play my 360 over the past several months, but i’m happy to say i’ve gotten to play it more, recently. downloaded Bastion over the weekend, and i’m loving it so far. Out of all the arcade games that came out this summer for the summer sale thing, the only one I bought was Iron Brigade and I love it. I’ve been playing it even more recently because they finally came out with the DLC a few days ago. Bastion and the others didn’t really interest me, and even though Bastion has some excellent reviews I’m just don’t want to. And I did notice that you had gotten on the day after I posted that. The Last Airbender was absolutely awesome. I still watch the reruns on nicktoons channel from time to time. I think I cry a little inside each time what’s-her-face dies and becomes the moon whenever I watch that episode. I don’t actually cry, but I do feel like I should do so. AAAGH! Mixed feelings! I was trying to laugh because it’s funny, but I’m also depressed because of Bot’s futile desporation to keep the Cornfather around! And being dead tired doesn’t help either! AAAGH! Don’t forget what we talked about. You know what you have to do. Jefbot’s never lived on his own, has he? Anxiety awaits, methinks. He might want to switch to decaf. Another Avatar fan here. And hey, Aang had the name before James Cameron. The Last Airbender movie did try to cram too much in and forgot about the characters as people, which was what made the show work so well. Looking forward to the new series with some trepidation. bot has lived on his own, Thorvald, but it’s been a while! you’re right, tho: anxiety awaits. and, yep – the movie’s biggest sin was not getting the characters right. had it done that, i think we could’ve forgiven it for trying to abridge so much of the first season. a little nervous about the new series, myself. hoping for the best, tho! I’m BAAAACK! Sorry I was gone so long. Just got our ‘net fixed today. Now I’m back and snarkier than ever! WOOT! So, the Father is moving on, huh? Hey, you’ll still be friends. And you can always find another roomie (I volunteer!). BTW, never saw the Airbender series or Movie. I was always at work when it came on TV, so I never got into it. I might check out sometime in the future. woo! great to have you (and your snark) back here again, KB! btw, Airbender is totally worth checking out. if you have Netflix you have no excuse. Sorry about the move. No can do (at least not IRL). Ah well. SH. You never made me any cookies!!! Like Xinda needs Cookies of DOOM! And He made you QUICHE?! Go on with the Bad A$$ Bot Familia! oh cornfather, we still love you… and the making buu is either adult buu or kid buu, I can’t tell, jut it’s just as awesome! i’m sure the Cornfather appreciates the love, Zed! and the awesomeness on the shelf is Kid Buu. good eye! Also, Toph is my favorite. not sure i could name my absolute favorite character if put on the spot, but Toph’s a good choice. just make sure you have your cookie recipe handy, dj! I had something like this when one of my roommates moved out. It really did feel like a relationship breaking up, including me finding all his crap everywhere at random times and piling the stuff on the kitchen counter while I contemplated a ritual burning. I didn’t try to talk him out of it, though, because he’d bought a house and was putting on his “big boy pants”. funny, Tiana – i’ve only found a couple things of Michael’s/the Cornfather’s, since the move, but i wonder how much of my junk he’s found in his stuff? probably a ton. hope he hasn’t thrown anything out! AVATAR!!!! I love that series! And how dare he resist the power of the cookie? @jefBOT Why are you using the Dark Sides cookies? No wonder he wont stay! *blink* Cookies of DOOM are the most scrumptious cookies in the whole of all known and unknown Universes (Or would that be Universi? What is the plural of Universe!) which is why they are irresistible! yes, in most cases you’d be right, DressesAreStupid, but i’ll refer to Pixie’s answer above, in this particular instance. and you’re in luck: all the episodes are indeed on Netflix, so go find the ones you missed! Not even for cookies?!?! Cornfather, you’re a twit! you’d think of all people, the Cornfather would be unable to resist homebaked cookies, TCG! I FINALLY started watching it last month. It had been one of those things where I always intended to sit down and enjoy it, but never got around to. Since I started, though, I am enjoying it. It’s easy to see why this show became a hit. I wish it had been around when I was younger. Also, am very excited about the Legend of Korra. i wish the show was around when i was younger too, Ri – i probably would’ve loved it even more! still, i’m glad i was able to discover it when i did. and, yes! Legend of Korra is eagerly anticipated! hope it lives up to the “Airbender” name. Yeah, this show is great. But I’ve got a kind of overdose because Nickelodeon repeats it over and over in germany. And like 4 times every year they do a whole weekend with “Airbender” from beginning to the end. Would like to see something new from that production team! shamalan’s was an abomination except one point, water benders cant create water earth cant create earth and i dont think air can create air (it never came up cuz air is all around) but why in the cartoon can fire benders create fire. i like in the movie that only masters could it only makes sense. other then that it suuuuuuucked. and i cant wait for LOK! Ha ha…sob sob. I miss the Cornfather already! because the D@^*& INTERNET IS A WEAPON OF MASS DISTRACTION!! Seriously, I’ve been getting caught up with your comic all afternoon. God I need to find a job.